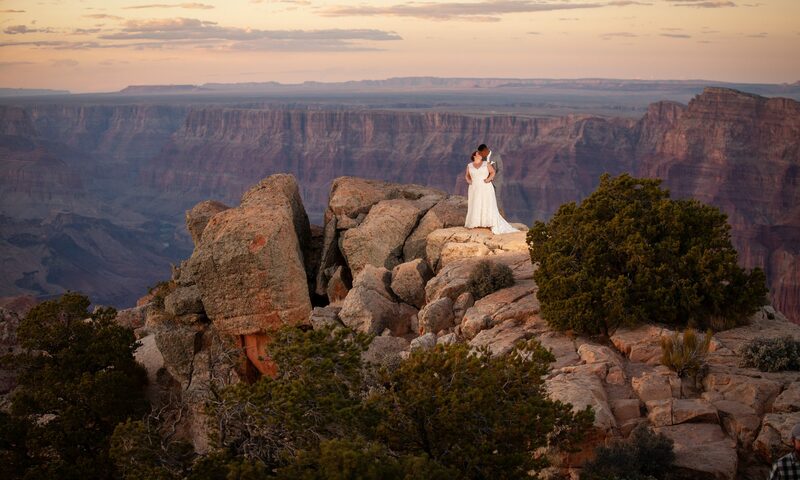 The Destination Wedding Ceremony PLUS package is suitable for groups that wish to have a wedding ceremony at one of the scenic overlook points within the Grand Canyon National Park, and would like to host an outdoor picnic or indoor dinner reception afterwards. All packages below can be customized to accomodate up to 75 guests (Wedding Couple included). The 75 guests limit is based upon the capacity of the largest available ceremony site at the Grand Canyon. Due to this restriction, outdoor ceremonies and picnic receptions will always be limited to 75 guests. Indoor reception can accomodate up to 250 guests. Professional photographer to capture your wedding ceremony and newlywed and family photos (ceremony location only). Professional editing, digital images and print release included. Sneak peak posted on Social Media within 1 week; all other images delivered electronically in approximately 4 weeks. *Photography time may vary depending on package selection, refer to your personal proposal for specifics. Photography time can also be added as an upgrade. Stunning, hand-tied rose bouquet in your choice of several colors with coordinating satin stem wrap and matching boutonniere (custom bouquets available as an optional upgrade). Acoustic guitarist to play on-location. Musician time depends on the package selected. Elopement style cake for indoor packages, or individual cupcakes for outdoor packages. Any location. Choose from a box lunch, sandwich variety platter or deli platter. BBQ – Pulled pork or sliced brisket, coleslaw, corn bread, baked beans and rolls. American Cookout – Hamburgers, hot dogs, potato salad, veggies and dip. Limited locations. Assorted gourmet sandwiches, antipasto skewers, seasonal fruit, spiced almonds, Idaho potato chips, hummus and fresh vegetables, crackers, olives, assorted condiments and gourmet cupcakes. Includes water and ice tea station; as well as plates, cups, flatware, service-ware, and 1 buffet server. Host an indoor dinner reception in a private banquet room after your Grand Canyon wedding ceremony. This package also includes non-floral centerpieces for the dining tables; several options available.